We’re in the second to last week of our crowdsourced video game project, and everything is beginning to wrap up. Our current vote may not seem monumental, but the choice will have a huge impact on the visuals in our final game: The props. On one hand, we could go the serious route filling our environment with realistic-looking circuits, cards and memory RAMs. 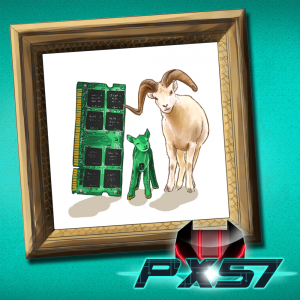 On the other hand, imagine a fluffy white farm ram running across the screen or a microphone instead of a sound card. What kind of world could we create? As always, the choice is yours! Head over to our voting page and weigh in on which types of props you’d most like to see. On our subreddit, we’re already working on the next, and last, vote: Soundtrack! Head over to submit tunes that you’d like to see as inspiration in our game. Better yet, create your own music and it might be featured. Thank you for adventuring through this project with us.